Free Multiple Wooden Chicken Coops plans - This site has a few ideas for cheap or free chicken coop supplies i.e. building materials, chicken feeders, chicken water containers, chicken nest boxes, chicken roosts, and a few recommended books on how to care for chickens. So you are thinking about building a chicken coop but don\'t want to spend a fortune on coop plans and building materials? This was my thought when I built my own coop a few years ago. 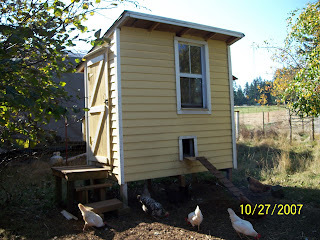 I have read that the average person spends $300.00 to build their coop and I did not want to spend that much - I scoured the internet to find free (or cheap) but well made chicken coop designs that I could either build myself or buy. I have included the links to FREE coop designs on the left side of the page. The links contain plans to big or small chicken coops, depending on your needs. I have also added some ideas for cheap or free chicken coop supplies i.e. building materials, chicken feeders, chicken water containers, chicken nest boxes, chicken roosts, and a few recommended books on how to care for chickens. I will be adding more information to each of these topics as time goes on. For now, I wanted to give you the basics and show you some pictures of the coop that I use and some of the supplies that have worked for me.